Hello Aspirants, as we all know that the KV Sangathan invites the 592 Application form for the posts of PGT. out of this, the KVS invites the 46 application for the post of PGT Computer Science. Every Candidate who are going to apply for the post of KVS PGT 2018 Exam they definitely want to know about the KVS PGT Computer Science Eligibility Criteria and KVS PGT Computer Science Age Limit. So Through this article, we will help you to know about the Complete Eligibility Criteria which is required for KVS recruitment Exam 2018. The Teachers are responsible for the perfect teaching and delivery of all subject, with the particular emphasis on the core subjects Like Literacy, numeracy, and science. 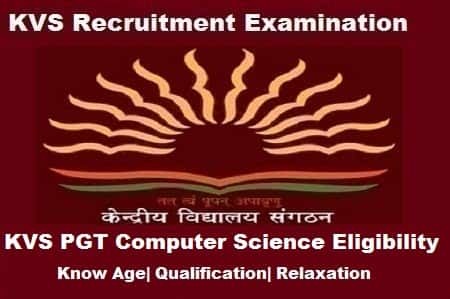 Before we speak about the eligibility criteria for KVS PGT Computer Science Now let’s have a brief look at the vacancy available for KVS Exam 2018. B.E or B.Tech(Computer Science/IT) from a recognized university or equivalent degree or diploma from an institution/ university recognized by the govt. of India. B.E or B.tech(any stream) and a postgraduate diploma in computers from a recognized university. Desirable Knowledge Knowledge of Computer Application. Age Limit maximum 40 Years as on 31.08.2018. Age relaxation for SC./ST and other categories as applicable under the Govt. of India Rules. Here in this section we have mentioned the complete Age limit and Age relaxation which is required to apply for KVS 2018 Recruitment Examination. Candidates are advised to check all the criteria before Filling the application form. (For Group- B posts only) 03 years after deduction of the military service rendered from the actual age as on the closing date for receipt of applications. (For Group-B posts only) 08 years (03 years + 05 years) after deduction of the military service rendered from the actual age as on the closing date for receipt of applications. All the concession mentioned above will be concurrent i.e. if a person is eligible for more than one concession, only one of the concessions of the highest permissible limit will be granted. For groups ‘B’ and ‘C’ posts, Ex-serviceman who has put in not less than months continuous service in an armed force(Army, Navy and Air force) shall be allowed to deduct the period of such service from his/her actual age. For any Query related to KVS Recruitments 2018, comment on the comment box mentioned below. Our expert will help you to make the Best preparation Strategy for KVS Recruitment 2018. Yes you can apply according to your qualifications.